This is a late review, since Short Term 12 was originally released in its theatrical form back in November. If you hadn’t heard of it before, then that’s because it came and went without any buzz or word-of-mouth to ensure its popularity like a lot of other similar films. Hell, the only reason this reviewer is looking at it now is because its local Picturehouse cinema was doing a special screening of it in line with its current re-showings of “forgotten gems”. It’s a great shame that Short Term 12’s cinematic fate was such, because audiences – nay, distributors who decided to give it a limited release in the first place – had no idea what they were missing. It is a mesmerising movie, one that is both engaging and mature, and deserves a far bigger audience than it got. Destin Cretton, who directs from his script based on his own short film of the same name, surprises you with how well he handles the drama and pace from behind the camera. His faux-documentary style filmmaking feels justified in its creating of a real and vibrant atmosphere, one that makes any emotion that comes across in every scene hit even harder toward home. His use of close-ups allow us to absorb any actor’s facial expression head-on – for example, in one of the film’s highlight scenes, distraught teenager Marcus (played by the exceptional Keith Stanfield) performs a rap song he wrote and the camera slowly but surely goes closer in to his face as he does. Talk about “in-your-face” all you want, but this instance is necessary because it allows us to capture everything this guy is feeling. Credit goes to the actor for delivering such an astounding performance, but also to Cretton for knowing when to give us the right feel and direction for every scene. Stanfield is a lucky member of a fantastic ensemble cast, led by Scott Pilgrim actress Brie Larson who is well on her way to acting greatness if her turn in this movie is to be believed. Handling subject matter as dark and unpleasant as child abuse is always difficult to do well, but Larson leaves behind any vanity and gives to the world a powerhouse performance that fires from all cylinders while still being extremely likable and very interesting all at the same time. As her partner, John Gallagher Jr is just as strong a presence and is one of the most lovable people you could possibly come across. His reaction to a certain bit of news about his future is just perfect and, once again, entirely believable. Meanwhile, Kaitlyn Dever is another of the younger performers to leave an impression with a much meatier role and she handles it beautifully with extraordinary composure and confidence. She is a very promising young actress who should have a wider reach when people actually start to see it. While we’re on that subject, it’s a missed opportunity for its distributors – or at least its ones here in the UK – to not give it the widest release possible. That means hardly anyone got a chance to see it in the cinema, its intended medium, and as such it went by like a passing car on the motorway. Not to sound like a whining child, but that’s just not fair; how come a film that has this much passion, this much emotional investment and this much love for its craft of storytelling pass by us unnoticed? Not only that, but the powers that be – aka the ones responsible for it getting an audience in the first place – just shrugged and threw it at us like they didn’t care, with hardly any build-up or implanted hype? It’s too late to go out in our dozens to the cinema, but we at Film Feeder implore you to order the DVD or Blu-Ray on Amazon so that the good efforts of these filmmakers do not go unnoticed by society. In fact, here’s the link. 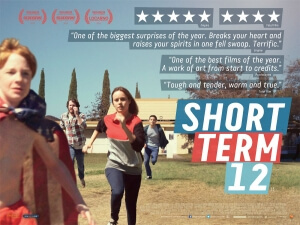 Go and order it now, because Short Term 12 is a film you really won’t regret seeing. Short Term 12 is the very definition of “undiscovered gem”. Strong performances all round, as well as competent direction and passion for storytelling, make it a film that needs a much bigger audience than its cinematic distributors wrongfully thought it deserved. Highly recommended for lovers of independent film.